This wine does not have such a strong taste as some of this type that I have tried but it is enjoyable despite that. There is the right amount of acidity and a good taste. I think that most people would prefer a Chianti but this is a good alternative. As a personal preference, I prefer the Cabernet Sauvignon from Chile that is in Penny Markt for a similar price but there is nothing wrong with this wine. 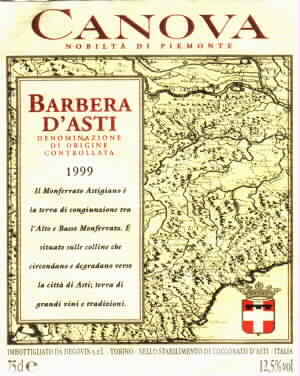 Asti is one of the best known areas in the Piedmont region of Italy. It's best known of course for the sparkling Asti Spumante, but the Barbera grape is widely grown in the whole Piedmont region. Bottled by Degovin s.r.l. Torino, Italy.